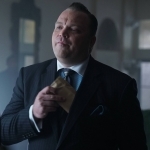 Gotham 3.4 “Mad City: New Day Rising” review: Alice is being questioned by Bullock. She tries to warn them about her crazy brother, who is playing strongman with someone’s head, in a really gooey way. Barnes (Michael Chiklis) is mad that Jim is involved, and gives him a dressing down, but orders some tests on Alice’s blood. Meanwhile, back at the lab… Lee tries to have a talk with Alice. She tells Lee about her brother. Jim is still affected by the ticking, but is saved at the last second by a regular Joe. 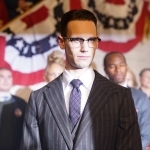 Nygma tries to convince Penguin that he doesn’t need Butch to pay off people for the election. But Penguin is quite insecure. Selina takes the doppelgänger to a bar fight. She gets caught, and almost gets her fingers pulled off. 5 comes in like a superhero, trashing the burly thugs. Our smart girl quickly figures out that he’s not Bruce. “Neither of you have a sense of humor.” He kisses her. 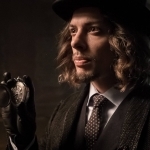 Jim comes into Barbara’s place, looking for Jervis Tetch. She really doesn’t know. I love this dance they do. 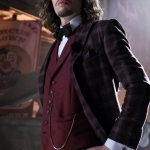 Tetch grabs some “Tweeds.” We really have fallen through the looking glass, complete with tea party. Jim comes in to see Alice. Barnes calls him “son.” The feels! He lets him go see her. “He’s still in your head, isn’t he?” Jim is desperate, and Barnes is listening, concerned. “He’s made you a prisoner in his own skin.” She tells him that he did it to her too, and made her think things. They invaded the GCPD. 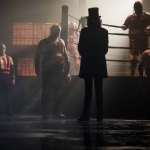 They did get Alice, and Tetch made Jim almost shoot himself in the head until Barnes knocked him out. When he wakes up, he’s handcuffed to Lee’s chair and she won’t let him out. She still cares. He’s on a 48-hour suicide watch. Tetch took her blood with the intent of making more monsters. Jim busts in with Harvey, but a metronome makes him freeze. Thanks to Lee he is able to shake it off. Not in time to save Alice though, and Tetch escapes with 2 Tweeds – perfect. Barnes: “James Gordon is gonna get you killed someday.” Please don’t be foreshadowing. Please don’t be foreshadowing. He won! Okay. I knew that was going to happen. He believes in him. But Butch and Nygma are enemies. Jim thanks Lee for telling Bullock where he was, and says he’s happy for her, or “trying to be.” That’s big of him. Bruce and Alfred confront Fake Bruce. Oh my god, HE’s Batman! He leaps away, and almost immediately kidnapped for his original purpose. 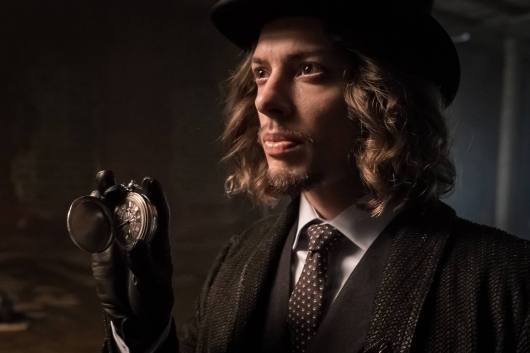 Penguin names Nygma his chief of staff. It’s hard to trust his two faces. Even though Penguin is a villain, he’s naive and childlike in his hope, and I trust Butch way more than Nygma (even though I do love him). Who is the real Barnes? This is going to be interesting. I really liked the movement in some of the relationships tonight – Lee and Jim figuring out how to move forward, Barnes giving Jim a bit more leeway and understanding, Jim and Barbara’s moments of real connection… it’s all about Jim. Penguin gains power as he narrows in on the nomination for Mayor of Gotham. Meanwhile, Gordon turns Alice (guest star Naian Gonzalez Norvind) into the GCPD for the bounty. 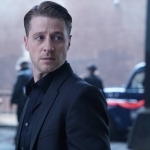 Also, Bruce and Alfred race to find Bruce’s doppleganger after learning he’s assumed Bruce’s identity in the all-new “Mad City: New Day Rising” episode of GOTHAM airing Monday, Oct. 10 (8:00-9:01 PM ET/PT) on FOX. Jim Gordon, under the Mad Hatter’s trance, stands in front of an oncoming semi truck. Penguin and Nygma reunite for the first time since getting out of Arkham.